After his family are killed in a freak car accident, five-year old Pete is left all alone in the woods - helpless against a gathering pack of hungry wolves. When all looks lost, an enormous dragon appears. The friendly, fluffy creature rescues Pete and whisks him away to a new life in the woods. While the next five years pass peacefully, Pete's friendship with the dragon he has named Elliot comes under threat from the encroaching lumber industry. Will renewed human contact be a blessing or a curse? 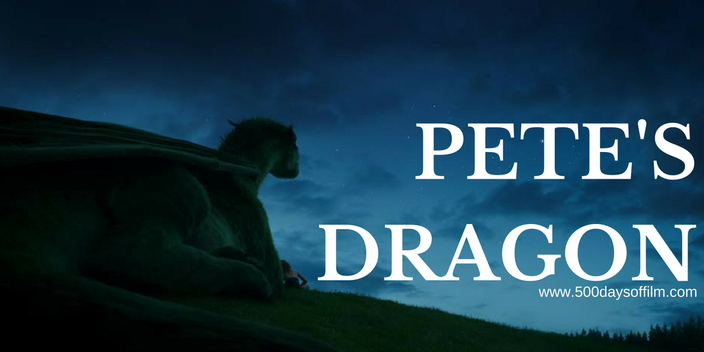 Pete’s Dragon is a moving and thoroughly entertaining family movie. Refreshingly, director David Lowery’s film moves at a slower, more considered pace than many children’s movies that I have seen of late. Gone are the incessant jump cuts and frenetic storytelling. In their place are stunning, soaring forest sequences, a beautiful score and a simple story of a family lost and a family found. Oakes Fegley stars as Pete, giving an engaging and natural performance - somewhat like a young Tarzan crossed with Mowgli. Meanwhile, Elliot is a lovable puppy-like dragon. His playful innocence is gorgeous and funny. The two form a friendship that reminded me of both E.T. and The Iron Giant (with an added hint of King Kong?). Ably supporting this central pair are Bryce Dallas Howard’s Grace and her father, Meacham (warmly played by Robert Redford). In addition, the film explores the rivalry between Grace’s fiance, Jack (Wes Bentley), and his brother Gavin (Karl Urban). While a little insubstantial, this sub-plot serves its purpose and drives the story forward. Pete’s Dragon takes its time to build atmosphere, tension and establish an emotional connection. I was surprised at how moved I felt by Pete’s Dragon and left the cinema feeling satisfied and uplifted. Have you seen Pete’s Dragon? If so, what did you think of this movie? Let me know by leaving me a comment in the box below!